The perfect solution to add HiFi audio to any project ! 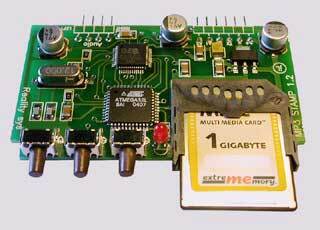 A single module that can manage FAT32 Memory Cards and MP3 decoding. It very advantageously replaces all types of audio players. Highly reliable, without any mechanical parts, this system can diffuse stereo hi-fi music or messages, 24 hours a day, 7 days a week. It can be simply started by closing a contact, for more complex applications it also includes a communication port. It stores messages & sounds on a standard removable SD/MMC memory cards, easy to replace and as easy as a Floppy Disk to copy. In accordance with compression rate and memory card capacity, up to 72 hours messages duration (voice quality and 1 GB memory card), but a 32MB memory card may already store up to 30 min. of Hi-Fi stereo quality (128kb/s). Over 250 reachable messages. Communicate with a Host CPU through a serial protocol (RS/232-485). Only 2 Headers (4+6) are needed to interface it including audio and power supply. Very small size : 65mmx40mm (2,5" x 1,5"). On board switches for stand alone application or local tests. Automatic start playing any track by simple contact closure. ASCII command protocol on bidirectional asynchronous serial port. Operating parameters stored in flash memory. Wide range power supply from 5V to 14V. High quality analog output for crystal clear noiseless sound. Audio output can be directly connected to headphones or mono/stereo amplifier.